On Saturday I went to have a look at the new Fall collection from OMG! Inc. I loved some of the new sweaters teamed with prim collars and hoods, these worked really well even in the laggy situation and I loved the really well defined textures on the knits. The dresses have got a lot more daring with floaty flex skirts that draw the eye. This blue model is slink at its best, sheer and daring cutouts on the top, featuring crossover straps with tapestry detailing on the bodice and gently pleated prim flex full length skirt This was one of my favourites. It was nice to see the gents didn't miss out and the new line of baggy combat pants with prim pockets worked really well and some of the suits too! As most of you know I have a special interest in mens clothing, good mens clothing, so I was delighted and excited to be asked to review the new tuxedo collection by Styles of Edo. Edo is justly famous for his wonderful menswear and with this collection he has surpassed himself. In the very near future (touch wood) I will be bringing you a full review of this collection with pictures that come close to doing the clothes justice. Having said that, no picture can do these clothes justice - Edo is one of the most skilled texture artists/designers on SL, and anyone who doubts that should cam in on someone wearing one of these new tuxedos - there are black details, on black textures which give the clothes depth and feeling. There are paisley waistcoats (vests to our American cousins) which shimmer and shine with subtle, fine detailing. These clothes are very very special - in fact I would say unique.I admit that both I and my model were worried when there was no 'skirt' layer to the jackets, but, (and this is real mastery) these jackets do not have the sprayed on look that some of us have come to dread, they actually look like they should. When I do the full review it will involve more details and LOTS of pictures but this collection is too good to only have one review. Styles of Edo have surpassed their usual high standards and. as someone who adores a well dressed male avatar, I, for one, thank them. If god is in the detail these clothes are truly divine. 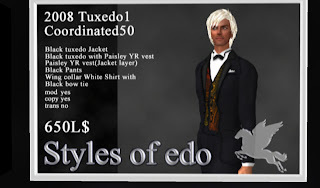 Gentlemen, I tell all of my clients they should own at least one decent tuxedo on SL, now I can amend that, every male avatar should own at least one (and good luck deciding which one - the variations are many and each better than the last) Tuxedo by Styles of Edo. A wide spectrum of creativity, individuality and teamwork allows OMG! INC. The Fall Collections. You will be brought into the Dark Side and released to the Heavenly Side! We cordially invite you to witness this first-hand, this is what a clothing company can be like in Second Life. By the way this is not just for women we have something for men as well, so don’t be shy fellows. 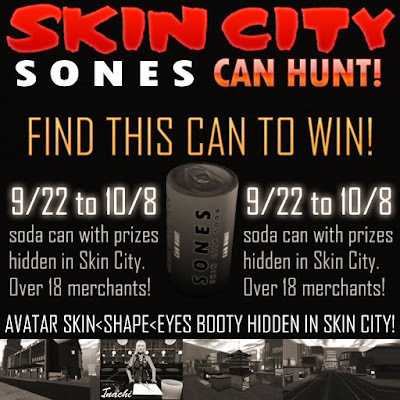 This event takes place Saturday September 27, 2008 at 1 pm SL time the location will be at OMG! INC. main headquarters at Sununu. More soda cans added daily... as new merchants arrive and get set up! You are cordially invited to the Grand Opening of Zullay Designs September 20th from 10am-4pm SLT. There will be a Scavenger Hunt at the start of the opening and also during the opening limited edition items will be passed out as free gifts to those attending the Grand Opening event. The designer and owner of Zullay Designs is Zullay Thor, whose motto is "Be Extraordinary." Zullay's line consists of gorgeous clothing, flawless skins, and beautiful hairstyles. She makes her unique designs in order to make each buyer feel special. Zullay loves fashion of all types from vintage to modern, as well as fantasy clothing and she makes clothing that appeals to fashionista's from all clothing backgrounds and preferences. Zullay's designs are the type of clothing one would vision a supermodel wearing as she struts down the catwalk. The bold use of color leaves a footprint in your mind of the outfit you have just seen and really makes the detailed design work stand out from the crowd of typical new designers. Upon entering SL, Zullay Thor was amazed by the amount of tutorials and information available for new content creators in SL. She was able to incorporate her graphic design experience and mix it with her love of fashion to create the innovative combination which is now known as Zullay Designs. 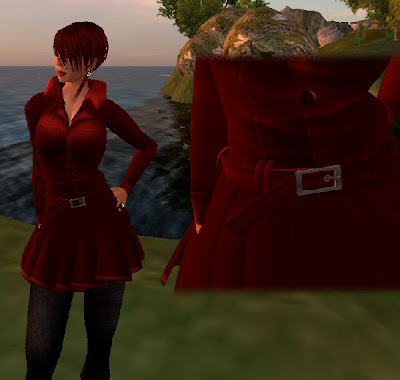 With her keen sense of style Zullay has begun what is the next step in revolutionizing SL clothing. She has stepped outside of the box with her Faerie Princess and Mermaid designs that will not only capture the attention of roleplayers they will also corral non-roleplayers into purchasing as well. Zullay has a style of her own and this is just the beginning of the bright forseeable future for this fabulous trendsetter who is sure to continue to amaze and rock the fashion platform of SL. Why be just ordinary when you can "Be Extraordinary." Visit Zullay Designs today and let the world see you as you see yourself. For more information regarding Zullay Designs, please contact Zullay Thor (Owner) Zullay Designs, or Annette Wilder (CEO) of Wilder Public Relations Firm. Almost two years ago, when I was still a newbie on the grid, one of the regulars in the club I frequented turned up one day in a small dragon avatar. I was instantly entranced, by the detail and the pure 'otherness' of dragon avs. Since then I have had many friends who spend at least some of their time in world as dragons. Although I love the look of these fantasic avs and I've had great fun flying (and being dropped from great heights) on the backs, talons and jaws of various dragons I've never taken the plunge myself. 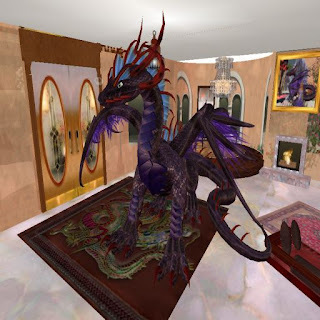 So eager to know more about the Second Life of dragons, I interviewed three regular dragon avatar users. Firehorse: What first drew you to wearing a dragon Av? George Tanabe:The artistry and the ability to fashion something beautiful and unique. F.R:How long have you been wearing a dragon av? D.C:Since about 30 days after being in SL so... about 14 months. D.V:I got the first one after about 3 months in SL. F.R. :Is the dargon av your main av? G.T:*one* of them is, yes. D.C: I am Lady Dragon most of the time as you fit better in places so I am either human form or 2 legged dragon one. D.V: I don't wear it often as I find its too big for most places - I also have a cute whelp (tiny dragon) plus a dragon pet which is worn on my shoulders and wraps around me. F.R:What is the appeal of being a dragon, for you? G.T:It's like a good coffee table book. It stimulates conversation beyond the usual. Often the topics swing to favorite books of mine, which feature dragons, of course. D.C:I love the beautiy and the freedom it represents and truly my heart is dragon. F.R:How many dragon avs do you own? G.T:Err...lost count... over 30 now. Some are mods of "packages"....but I own most of the adult and tiny versions from IoW plus a dozen more from around SL. D.C: Six Isle of Wyrms wyrmlings and wyrms, one W&M one and one 2 legged one. D.V: Three actual dragons plus several draconite avatars which are like a humanised form. Don't forget everyone now has the dragonlet from Grendels children as a default avatar now. F.R:What is the favourite dragon av you own? G.T:Steam Dragon Hatchling... I call him Gadget, for my love of all things mechanical and steam-punk related. F.R: How do you spend your time when in a dragon av? F.R:How do you spend your time when in a dragon av? G.T: Wandering about; chatting with friends, dragon or otherise; annoying 'humans' and 'elves'...generally being goofy. The same I did as a human AV, only this is funnier. D.C: Hanging out with my dragon partner, my dragon friends... dancing at clubs, flying. D.V:Usually setting fire to people on the dancefloor - the whelp has a couple of dances with it. F.R: How do you find people respond to your dragon avs? G.T:Usually with curiosity and appreciation of the appearance. Most folks are very tolerant of tinies. Now, when I drag the BIG dragons out, a lot of people either are astonished at the size or get pissed because I stomp all over them. D.C: Some are shocked most are amazed! The love looking at it and they seem to want to talk to me more so because of it. F.R: Who is your favourite maker of dragon avs? G.T:Daryth Kennedy, though Flea Bussy comes a close second. And Rock Hayek's anthrodragons are the best I've ever seen. D.V:Grendels Children without hesitation apart from the fantastic quality they keep their prices very low for all their avatars. F.R: What is the most you have paid for a dragon av? D.V:I can't remember the price but I know the Uthgolian was the most expensive. 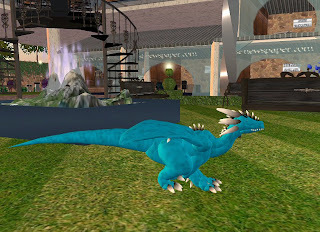 F.R:Would you recommend other people try being a dragon on SL and why (or why not)? G.TSure. Being a dragon is a unique experience in SL. It's a lot of fun and you can support the great artists who design these lovely creations. D.C:I would if you know you are dragon... most dragons knew/know that they are truly dragon... it's not an experiment it's more a state of mind, a state of being so to speak... you have a dragon heart and you just KNOW you are DRAGON. D.V:I would recommend anyone to try it out, but it is definitely for roleplay more than everyday wear. 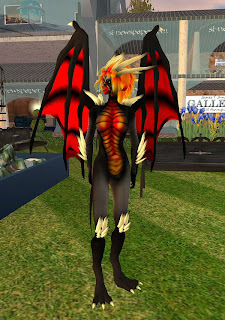 There are a lot of dragon communities in SL if your interest lays in being a dragon full time i would suggest looking into these.manipulating the camera and movement as a huge dragon is problematic - I don't think its something a newbie should try until they have mastered movement controls as a normal avatar. 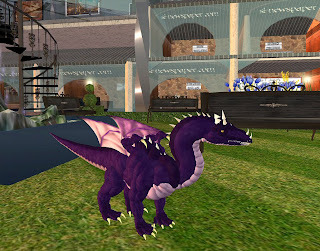 I hope this article has given an insight into dragons on Second Life. We all have a free dragon av in our inventory now, so give it a try, you might be suprised. With much thanks to George Tanable, Dezaria Cazalet Astral Dragon and Dana Vanmoer. Pictures are of Dezaria, Dana and dragons at the Isle of Wyrms. 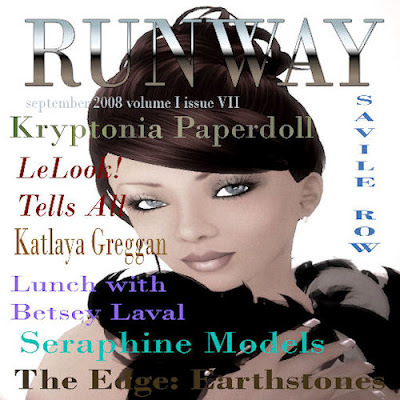 Since launching their first issue in March 2008, RUNWAY Magazine has made its mark on the fashion industry in Second Life, distributing over 40,000 copies of their August 2008 issue alone. RUNWAY Magazine's CEO Maggie Mahoney states, "RUNWAY is more than just a LookBook with glossy pictures and a list of where to shop. We offer our readers an in-depth look at the models, the designers, the agencies, and fashion news in Second Life on and off the runway. Our content is truly what makes RUNWAY unique and it is virtually unmatched by any other fashion magazine currently available in Second Life. 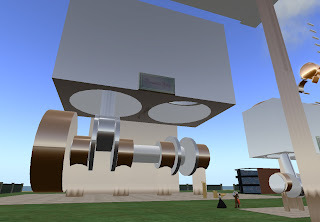 The RUNWAY staff is top notch and they work very hard to make RUNWAY the best fashion read in Second Life." RUNWAY Magazine is a monthly in-world publication dedicated to the promotion of fashion, modeling, and design in Second Life®, featuring the who’s who in the fashion world - the seasoned designers, models, and agencies, as well as the fresh new up and coming talent on and off the runway. Covering all the fashion shows and events across Second Life® and bringing the readers the latest news, updates, revues, and slideshows of the designs captured as they happen with not only the in-world magazine, but a digital web version as well. RUNWAY Magazine prides itself as remaining agency and designer neutral, working in cooperation with all modeling agencies, organizations, and designers to provide them exposure in the Second Life® fashion world. Ocean Bates, CCO and Director of Marketing for RUNWAY Magazine, shared "RUNWAY is a smart media buy for designers, agencies and the like. Our subscription rates are the most affordable on the market and the exposure is exponential. We had 40,000 pairs of eyes reading RUNWAY in August - that is real marketing at work. Our readers, and our advertisers, tell us that they read us cover to cover - twice. The numbers show we are doing something right and we have just gotten started. We recently implemented the RUNWAY Café, a reader café for residents to relax and enjoy publications from across the grid, not just RUNWAY. We have two open currently - one at InStyle Fashion Mall and a second at Odessa Majestic. One café is currently under construction at the new Haute Couture complex alongside PhotoLife, and we have plans for several more. It is our way of giving a little back to the readers and businesses that contribute and support our efforts." 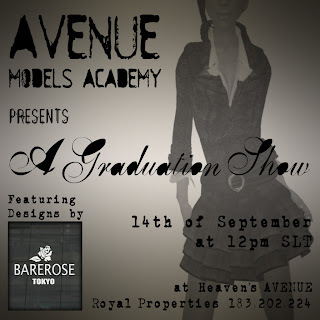 RUNWAY Magazine also sponsors fashion-related events throughout Second Life. 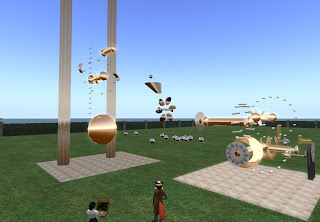 Their involvement in the 2008 MFA Awards helped bring even more awareness to the residents of Second Life on the nominees. RUNWAY Magazine is one of the sponsoring organizations for the upcoming 2009 Miss Costa Rica Pageant and the 2009 Miss SL Universe Pageant. RUNWAY Magazine also hosts four annual fashion revues with their two most recent - the Bridal Revue in June 2008 and the End of Summer Revue held in early August. Mahoney noted that a Couture Revue is currently being planned for November, as well as the opening of their new headquarters at Bryant Park in October. RUNWAY Magazine will close out 2008 with their Model of the Year Awards. "We think it is safe to say that RUNWAY is here for the duration and we want to thank our readers, advertisers, and those who make RUNWAY what it is - the best fashion read in Second Life. We have lots planned and hope that everyone will enjoy and benefit from the hard work we put into each event, each issue and each new endeavor we undertake," states Mahoney. Copies of RUNWAY Magazine are available in-world from any RUNWAY Magazine kiosk, complimentary on SLExchange.com and OnRez.com, and can also be viewed on their website at www.runwaysl.com. I was in Second Life Friday night when I got an IM from someone, an Emilin Nakamori, “Good evening :) I believe I may have a story that your newspaper may be interested in.” She told me she had made a machine in Second Life that moved without the need for scripts, “specifically, a weight-driven pendulum clock escapement (an escapement keeps the pendulum swinging).” Curious, I chatted with her for a few minutes via IM before heading to where she told me she was, in the sandbox in the Whitmyre sim. 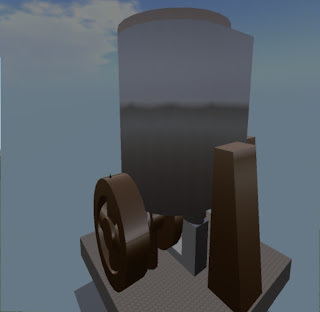 She then mentioned another physical machine that had been well received by others, and rezzed what she called a Physical Chain Demonstrator Base, “You click on the rotating arm to start or stop its rotation. If you change the orientation of the base, the script malfunctions.” Commenting at one point, “Unfortunately, I am no scriptor; that is why I got into physical machines ... Perhaps I should have gotten fascinated by something that isn't too ephemeral to sell ;) ... Sooner (usually, alas) or later all of these machines break, even if not left running. I thanked her, then noticed she had changed the title over her name to “Madgirl.” Being a reader of online comics, I asked her if she was a reader of “Girl Genius” by Phil Foglio. She smiled, and after talking a little about the comic, she gave me a replica of the Heterodyne trilobite emblem. It was then that the two of us parted ways, presumably the maker of these physical machines, part science and part work of art, going back to business. 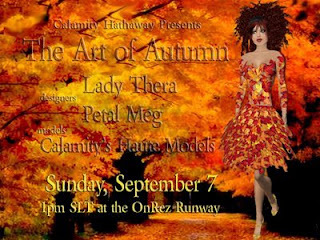 Calamity Hathaway Presents the "The Art of Autumn"
There's a chill in the air, the colors are changing, and it's time to mark your calendars for CH Enterprises' annual Fall runway show Sunday, September 7, 1pm SLT at the OnRez runway. You won't want to miss a second of "The Art of Autumn" as fashion event director Calamity Hathaway presents the colorful art of Thera Taurog of Lady Thera designs and Fuscia Jewell of Petal Meg jewelry designs. "I chose to showcase designers Thera Taurog and Fuscia Jewell in my annual Fall runway show because their designs are so perfectly suited for Autumn colors and themes. Lady Thera designs are literally wearable art. Thera has brought the works of the greatest artists' of all time into SL and worked them into fabulous dress designs. Her designs are elegant but fun and excellently executed, easily one of the best and most daring designers in SL. I have wanted to showcase her designs in one of my runway productions since the first time I saw her work. So, this show is very exciting for me," said Calamity Hathaway, runway show director of CH Enterprises. "Petal Meg jewelry is perfect all year round, but especially for Fall. Her lovely flower creations imported from RL to SL are unlike no others, Fuscia's designs are unique. I have featured her jewelry in other runway shows, and I'm very happy to showcase her designs in the Art of Autumn fashion show," she said. The subject for this week's avatar article is a new brand of tiny av: Loco Pocos. Created by Damien Fate, these tinies were first available earlier this summer. Considering the uber-cutness of the avatar and the variety of facial expressions and emotes, the Loco Poco can only be called first-class, possibly *the* best tiny avatar in Second Life. Tiny avatars I’ve seen are designed for a cute-factor in mind. Loco Pocos excel at it. 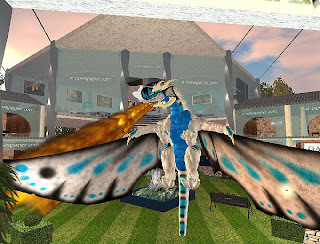 The avatars are also designed to be easily customizable, the avatar able to change it’s coat and eye color, as well as able to wear wings and other attachments. But what sets them apart from others is the ease of use of their animations, coming right with the avatar. 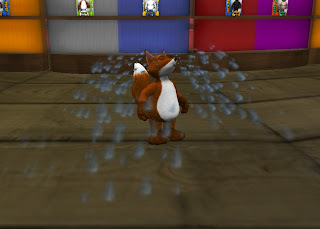 The HUD unit allows the player to express a number of facial expressions and full body emotes. The facial features are not static, but change to reflect emotions. Plus they often make sound when emoting. With a press of the button, the avatar can look angry and “grrr,” to laying on the floor and snoring, to crying a shower of tears, to throwing a kiss with a “mwaah,” to a hearty belly laugh, and more. The name Loco Poco translates to “crazy tiny” in Spanish, appropriately enough. The instructions are also in several languages. 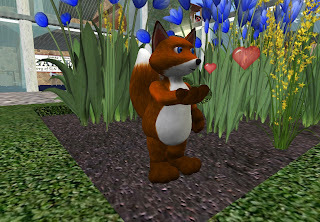 It’s also noteworthy that Torley Linden was among the beta testers of these tinies. The store is just in front of the main porting entrance. 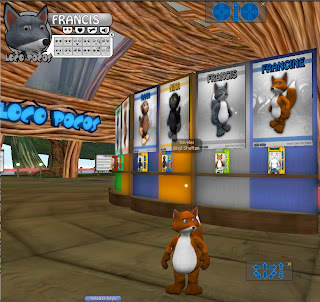 Avatars are sold in the center, accessories on the edge to the right of the door when entering. Their avatars cost 350L each, most of the accessories 100L. They also advertise an Avatar Rendering Cost (how much computer power it takes to make your avie appear) of 640. After some thought, I decided to try out the Loco Poco fox. Showing it around to my freinds, they were amused by the versatile tiny, going “Awww” at the sight of it’s emotes. One told me he was thinking of getting one. Besides Loco Pocos Island, you can also get the avatars at SLExchange. Loco Poco also has an adventure-filled island, made with these avatars in mind. One that can provide hours of fun. Look for a detailed article of the island in the near future. The Archipelis company is pleased to announce the availability of the version 2.0 of Archipelis Designer. Archipelis Designer takes a different approach to creating 3D models by simply drawing its shape! Just draw the contour of the various shapes of the model (for example: the head, the body, the legs) and Archipelis Designer automatically merges them and applies textures. It is also possible to use a picture or photo as a background and follow the contours on it.Thus, very simply and in about ten minutes, it is possible to create realistic organic models and to export them in widespread 3D formats like VRML, 3DS Max, DirectX or Google Sktechup and moreover Second Life. All that for 38 euros for Apple Mac OS X and Windows. Archipelis is a young company located near Bordeaux, France. It started its activity in the beginning of 2007 by providing Archipelis Designer, a 3D tool for both beginner and advanced 3D designers who wants to create 3D content in a fast way. Now, with the sucess of metaversed worlds, Archipelis is entering and focusing on this market with new applications.